Net Send GUI is plain instant LAN messenger for easy communication. It uses proprietary network protocol which one is based on TCP/IP, and it is not compatible with Microsoft NET SEND. But the Net Send GUI fully compatible with Winpopup LAN Messenger, OfficePopup and etc. 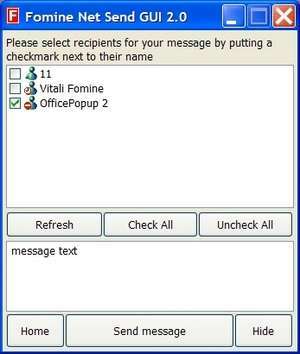 For security reasons, you should also check out the Fomine Net Send GUI download at LO4D.com which includes virus and malware tests. Additional screenshots of this application download may be available, too.